Curcumin, which has powerful antioxidant properties, is the most active constituent of turmeric. Turmeric has a long tradition of use in Indian Ayurvedic medicine (since about 1900 BC), and is also known as the Ayurvedic Spice of Life (not to be confused with Be Young's Spice of Life Blend Essential Oil). Turmeric has a beautiful bright yellow color due to its curcumuinoids. 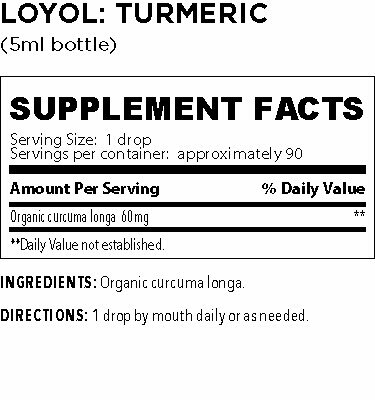 For thousands for years Turmeric has been revered for its powerful properties. It is said to be one of the world's healthiest foods—the bright orange-yellow equivalent of putting your insides through a car wash. An essential, mildly-flavored ingredient in curries (along with thousands of years' worth of Indian and Middle Eastern dishes), turmeric is exactly what the doctor ordered. 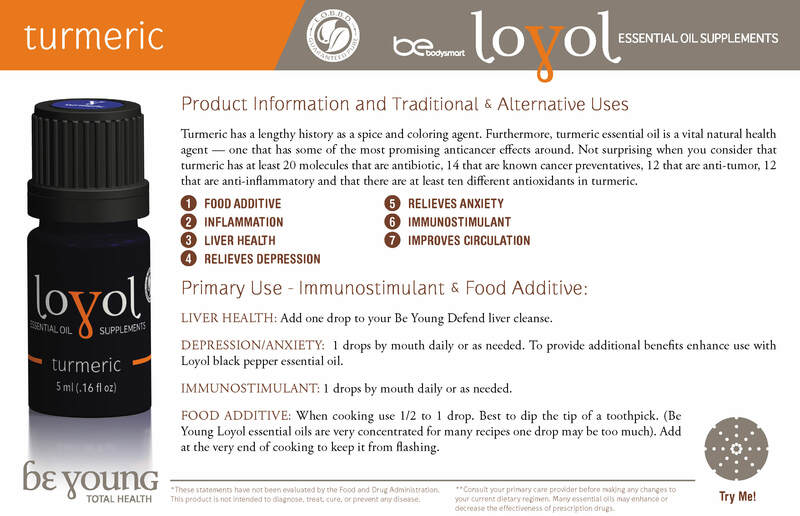 When using in place of Turmeric powder use 1 drop of Be Young Turmeric essential oil to 1 tsp of Turmeric powder. The interactions listed below are based on reports in scientific publications, laboratory experiments, or traditional use. You should always read product labels. If you have a medical condition, or are taking other drugs, herbs, or supplements, you should consult with a qualified healthcare provider before starting a new therapy. Information below is provided by Natural Medicine Database. BILE DUCT OBSTRUCTION AND GALLSTONES: Turmeric can cause gallbladder contractions (11145). Use with caution in patients with gallstones or gallbladder disease. BLEEDING DISORDERS: Turmeric has been reported to have antiplatelet effects (11143, 81204, 81217, 81271). Theoretically, taking turmeric might increase the risk of bleeding and bruising in individuals with bleeding disorders. DIABETES: In a case report of a patient with diabetes, curcumin caused a decrease in blood sugar (81219). Evidence from animal research also suggests that curcumin can decrease blood sugar levels (79114, 79573, 79591, 79692, 79984, 80155, 80313, 80315,80476)(80553, 81048). Use with caution in patients with diabetes, as there may be an increased risk of hypoglycemia. GASTROESOPHAGEAL REFLUX DISEASE (GERD): Turmeric can cause adverse gastrointestinal effects including dyspepsia, distension, and gastroesophageal reflux (18204). Theoretically, taking turmeric might worsen symptoms of GERD. Use with caution in patients with GERD. HORMONE SENSITIVE CANCERS/CONDITIONS: Some in vitro evidence suggests that curcumin, a constituent of turmeric, can competitively inhibit the binding of 3H-estradiol or beta-galactosidase with the estrogen receptor (21486, 26203, 26204). Theoretically, turmeric might have mild estrogenic effects. However, other in vitro research suggests that curcumin can counteract the proliferation of cervical and breast cancer cell lines in response to estradiol and/or irradiation, suggesting that it might have beneficial anticancer effects against hormone-sensitive cancers (26205, 26206). Until more is known, advise women with hormone-sensitive conditions to use turmeric cautiously. Theoretically, turmeric may exacerbate hormone-sensitive conditions such as breast, uterine, and ovarian cancer; endometriosis; and uterine fibroids when used in large amounts. INFERTILITY: Evidence from in vitro and animal research suggests that curcumin can decrease sperm motility and density; cause degenerative changes in the seminiferous tubules; reduce luteinizing hormone (LH)-stimulated production of testosterone in adult Leydig cells; and reduce fertility when administered orally (79404, 80650, 80944, 81069). Until more is known, use with caution in patients trying to conceive. IRON DEFICIENCY: Although intake of turmeric at levels commonly found in the diet does not appear to reduce iron absorption in humans (21471), animal and laboratory research suggests higher levels of curcumin or turmeric may chelate iron and prevent its absorption (21467, 21468, 21469, 21470). Use with caution in patients with iron deficiency. SURGERY: Turmeric has antiplatelet effects. Turmeric might cause excessive bleeding if used perioperatively. Tell patients to discontinue turmeric at least 2 weeks before elective surgical procedures.